BBC News - Newsnight - Should control and bail orders be scrapped? Should control and bail orders be scrapped? A man judged to be a threat to national security has decided to break his strict bail conditions so he can speak out about the difficulty of his life under virtual house arrest. Hussain Saleh Hussain Alsamamara, a Jordanian living in London, has been filmed over the past six months by two independent film-makers who then passed the material to the BBC's Newsnight programme. The government says Mr Alsamamara is a committed Islamist extremist and a danger to Britain. Almost all of the evidence against him is thought to be intelligence material which neither he, nor his lawyers have seen. 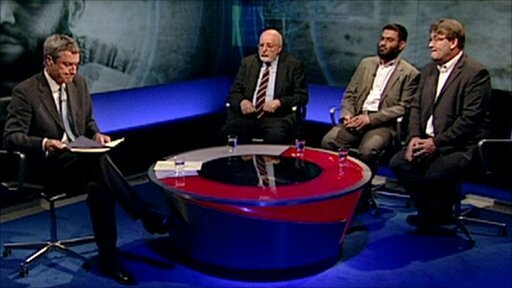 Sir Brian Barder who was a founder member of the Special Immigration Appeals Commission, but who resigned over what he saw as their failure to stick to basic legal principles, Dr Usama Hasan from the Leyton Mosque and Tony McNulty who was a security minister in the last government, join Newsnight's Gavin Esler to discuss the use of control and bail orders. Broadcast on Wednesday 16 June 2010.